Christchurch’s earthquakes have been very serious disruptors ( of life as we all knew it). Seven years on now (2018) and the reminders of what was, and what’s to come, in terms of the rebuild of Christchurch City, still affects us all greatly. Traffic guidance orange road cones have become the norm around the city as infrastructure and roading repairs/changes continue. The addition of cycle ways to the city roading network has created a lot of both positive and negative discussion particularly where the introduction of these dedicated mini cycle lanes has resulted in narrowed roads for both cars and trucks. One can suspect that much of this civil work may have to be undone when self guidance EV cars and buses make their appearance in the next decade . Roading design then will be concentrated on the removal of road lane encumberances such as the jut outs, now common place in the city, and street corners and intersections will also require simplification. Here in Sumner, by the sea, we have a lot to be thankful for, including a community spirit that is alive and well, good local shopping for the essentials of life, and a view of the Pacific Ocean with a lovely beach to walk on while contemplating the meaning of life! And then there are Sumner’s dogs, and I would suggest that our village has a lot of caring dog owners in residence who can be seen religiously street walking or beach walking their companions each day. 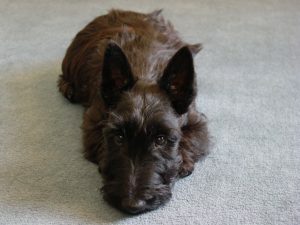 Of course I couldn’t let this post go by without mentioning that our own much loved Scottie dog…Kara , now about 9 years old, who is still performing her unique mix of meet and greet at the front door, security duties, and general icebreaker and conversation starter as required, in the hotel lounge. Simply put, we would not be without her. 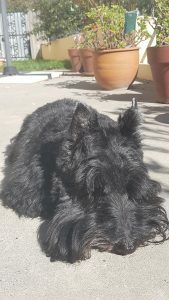 Such is the global interest in Scottish Terriers, there is a closed group on FaceBook called “Adopted by Scotties”. Not really sleeping..but keeping an eye on things. As Le Petit Hotel’s Scottish Terrier , it’s a while since I’ve been in touch with the wider world…& much has happened in both Sumner and Christchurch . I’ve grown up fast and the earthquakes are supposedly behind us, the experts say, but I am still anxious when I hear strange noises. 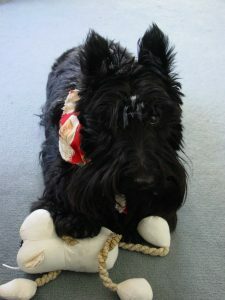 I’m now 9 years old, and my black overcoat is showing some grey hair now! I’m still performing my hotel guest welcoming routine…racing to reach the front door before Bruce, after the door intercom phone rings, so I can see the new guests first. I really live for my meet & greet job. A French philosopher whose name I can’t recall, once wrote that to understand fully one’s soul, you need to first love & understand a dog. I often ponder this view, as Martine & I move onwards with Kara, our new Scottish Terrier. Here at Le Petit Hotel, we look at our Juscot Scottie, her physical disability, and her ability to surmount the difficulties it presents her; and then ponder her unmistakable happiness at the thoughts which obviously flood her mind, when she anticipates being taken for a simple walk by either of us. It’s a constant reminder that the simplest things in life can & should be enjoyed. And so it is with an American NY Times contributing writer Dana Jennings. Dana’s New York Times Health blog is an ongoing story of one man’s brave journey with cancer. It’s an exemplary human story of adaptation, courage, gratitude, resilience, and the ability of the human spirit to rise above adversity…and well well worth a read.